PXI Digital I/O Subsystem - GX5960 | Marvin Test Solutions, Inc. The GX5960 digital subsystem represents the highest level of performance available for PXI-based digital instrumentation and features high performance pin electronics and a timing generator / sequencer in a compact, 6U PXI form factor. The GX5960 series consists of the GX5961 clock generator board with 16 driver / sensor channels and the GX5964 driver / sensor board which supports 32 bi-directional I/O channels. 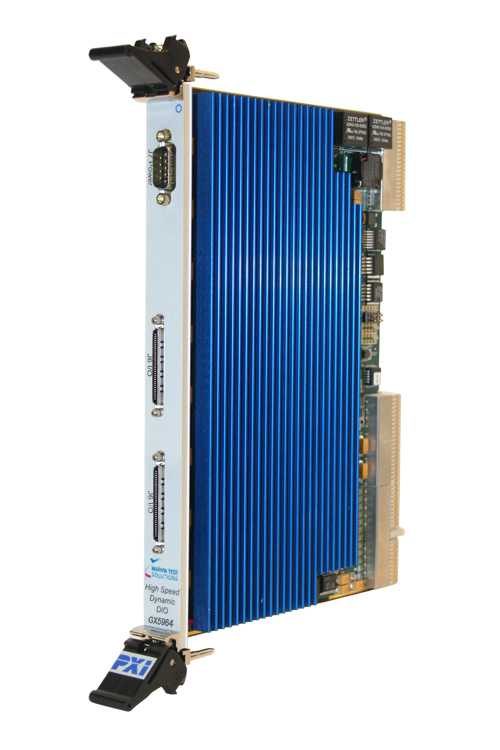 Up to 528 digital I/O channels can be supported by the GX5960 digital subsystem. Each digital channel features a wide drive / sense voltage range of -14 V to +26 V (maximum swing of 24 volts) which can be individually programmed for a drive hi, drive lo, sense hi, sense lo, and a load value (with commutation voltage level) – offering the user complete flexibility when creating test programs and fixtures for multiple UUTs. 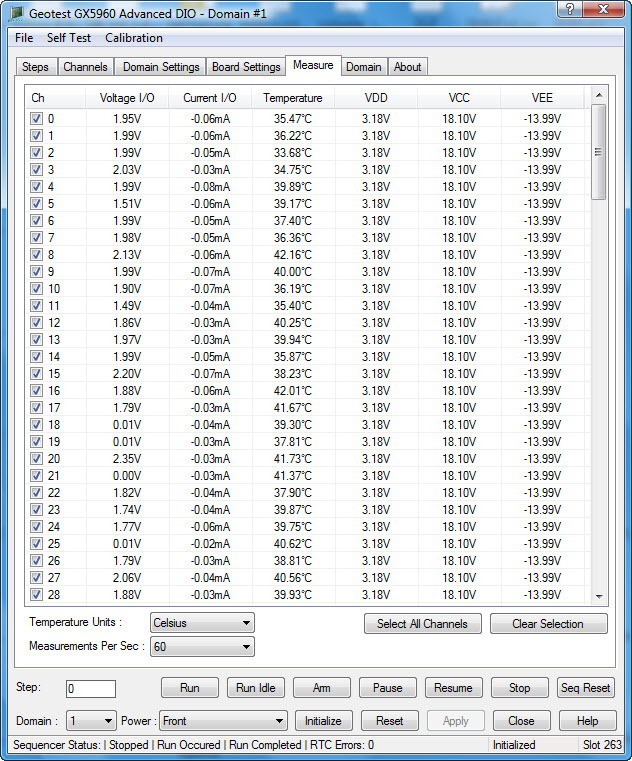 In addition, each channel offers a parametric measurement unit (PMU) for DC measurements. The GX5960 offers real-time digital stimulus, record, or expect data modes on all I/O channels. Pattern memory depth is 256K words. 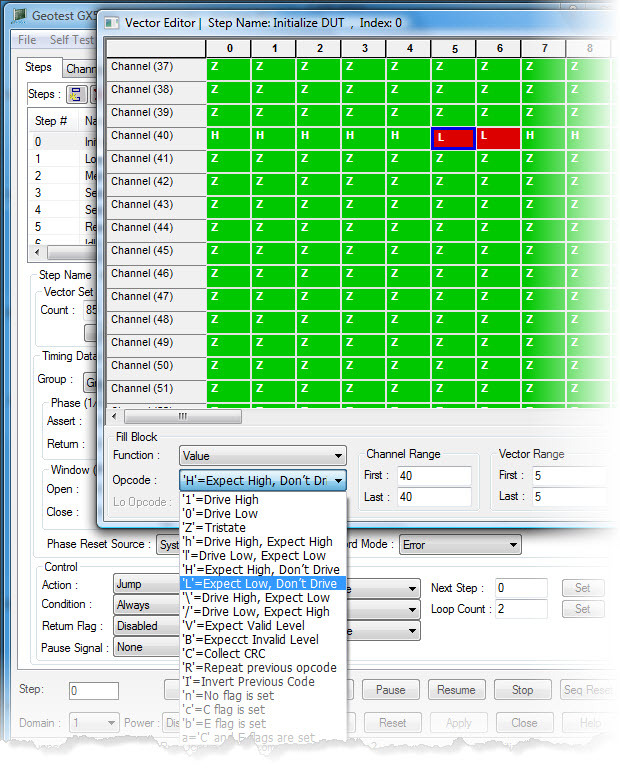 Each channel can be configured as an input or output on a per cycle basis. Six drive data formats are supported: NR, R1, R0, RZ, RC, and Complement Surround – providing flexibility to create a variety of bus cycles and waveforms to test board and box level products. The GX5961 provides timing, input / output synchronization signals, and sequencing as well as 16 I/O channels. Additional channels can be added to the system by installing one or more, GX5964 boards which are interconnected via the PXI local and trigger busses. The GX5961 offers a flexible clock system which allows the module to operate as a timing master to the UUT or be slaved to the UUT’s time base or some other external clock. All pin electronic resources are independent on a per channel basis – offering the user complete flexibility when programming drive / sense levels, source / sink currents, slew rate, skew, or PMU functions. The PMU can operate in the force voltage / measure current or force current / measure voltage mode and is useful for measuring a UUT’s DC characteristics. In addition, each I/O channel includes an analog bus relay, which allows each channel to support hybrid channel (digital or analog) measurement capabilities. For analog stimulus / response measurements, the analog bus can be connected to external resources via a dedicated analog bus connector located on the front panel of the module. The GX5961's sequencer supports sequences up to 4096 steps and has 16 loop counters that may be nested. The sequencer supports a variety of sequencing functions including jumps, subroutines, looping, and test inputs. All of the sequencer commands may be programmed using a Graphical Vector Editor, Windows® API commands, or via a script language. The sequencer allows the user to generate test vectors indefinitely at maximum test rates. 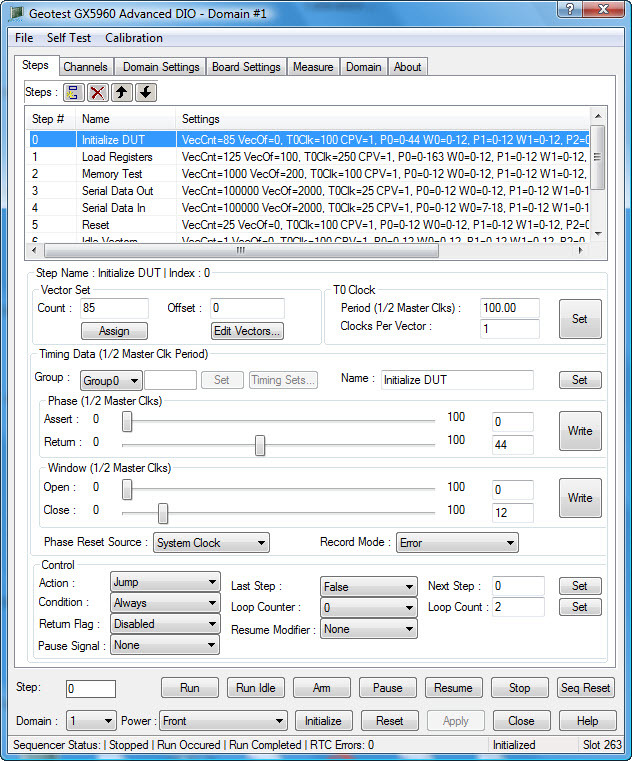 Internal and external trigger and pause commands are available in several modes. The GX5961's timing generator supports 256 timing sets which can consist of up to 4 drive phases and 4 sense windows for 4K of sequence steps. The T0 cycle or sequencer period range is programmable from 20 ns to 64 us with the phase and window values programmable from 0 ns to 64 us. This flexibility offers the user the ability to address a wide range of applications including the emulation of complex bus cycles and proprietary digital interfaces. The GX5960 subsystem can operate in any 6U PXI chassis that supports an air flow rate of 20 cfm/slot. Power for the pin electronics requires the use of external power supplies or the GX5960 can be used with a Marvin Test Solutions GX7005A / GX7015A / GX7017 PXI chassis which are designed specifically for high performance / high power digital applications and includes the necessary pin electronics power supplies. The board is supplied with GtDio6x, a software package that includes vector editing, a virtual instrument panel, and 32/64-bit DLL driver libraries and documentation. 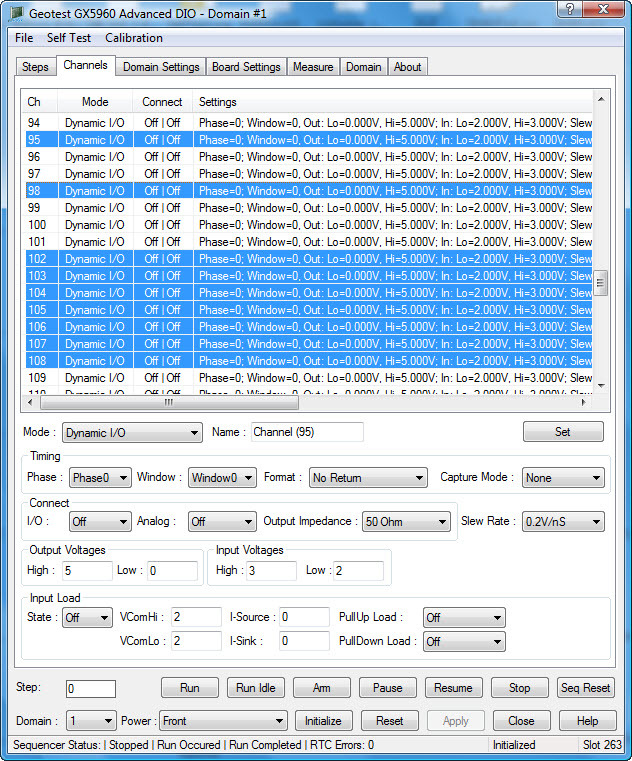 The virtual panel can be used to interactively program and control the instrument from a window that displays the instrument’s current settings and status. In addition, interface files are provided to support access to programming tools and languages such as ATEasy, LabView, C/C++, Microsoft Visual Basic®, Delphi, and Pascal. On-Line help file and PDF User's Guide provides documentation that includes instructions for installing, using and programming the board. 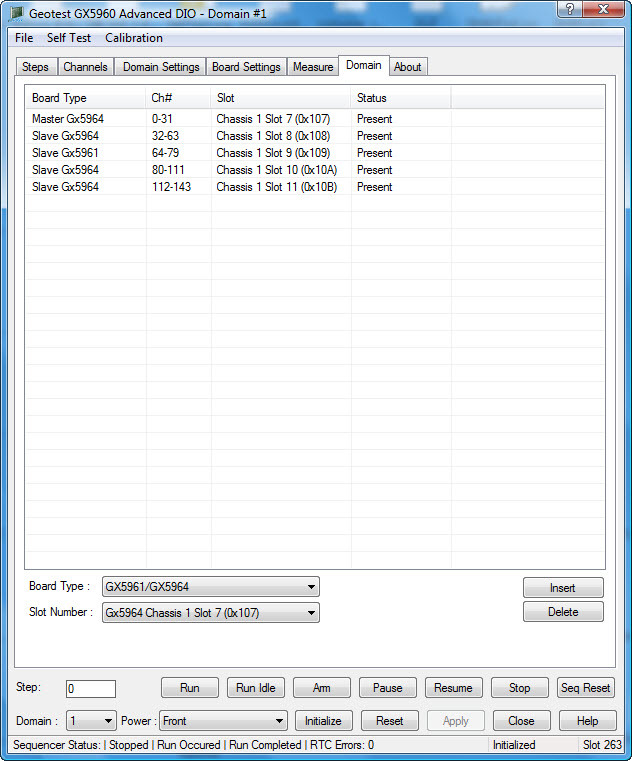 Other optional software packages are available to support the importing of CASS digital TPS’ or IEEE-1445 .tap files.